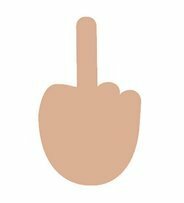 When Windows 10 comes, it's bringing a rude new emoji with it. As Gizmodo reported Monday, Windows 10 will allow users to send and receive a hand with the middle finger extended. The update will come with a couple of upgrades for existing emojis, like a "sassier" image for the "information desk person," which you probably thought was a woman flipping her hair sarcastically. As part of the update, which is expected later this year, you'll be able to apply a range of skin tone modifiers to emojis, so you can insult your friends with a true melting pot of middle fingers. The middle finger has technically been possible to implement since last year, but most services don't allow it to display. Thus, Windows users might be stuck flipping each other off, since their iPhone-wielding friends won't be able to see such an insult. Windows 10 will be available on almost every type of device imaginable, but emoji are perhaps best associated with smartphones, where they're plugged into texts and tweets. On that front, Microsoft has a bit of an uphill battle, as Windows Phone represents a very small portion of the marketplace.